Looking for offers on Flight Bookings ? 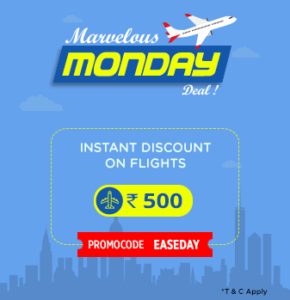 Easymytrip is back with an awesome offer. Get Rs. 500 instant discount on Flight Bookings of Rs. 2500 and more. Additionally, you can get 10% Extra Cashback on paying via Amazon Pay. If you are about to book flight ticket, there can’t be a better offer than this. So, Hurry and Enjoy this offer !!! How to Get Rs 500 off on Flight Bookings of Rs. 2500 + and Get 10% Extra Cashback with Amazon Pay ? 2. Enter Origin, Destination, Departure Date, Number of Seats and Class. 4. You will get a list of Flights operating in that particular route on that day. 5. Click on any Flight and Proceed to next Page. 7. Enter your Email and Continue Booking. 9. Now Pay via Amazon Pay to get additional 10% Cashback. 10. Success ! You will get your ticket details on your Email. This offer is valid only on bookings made till 31st July 2018 and Travel date should be till 31st Dec 2018. The offer is valid for minimum transaction of Rs.2500 on domestic and minimum transaction of Rs. 5000 on international flights.